Arthrography is medical imaging to evaluate conditions of joints. 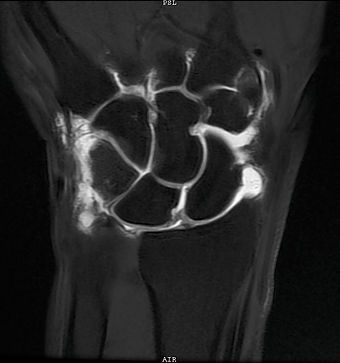 In an arthrogram contrast medium is injected directly into the joint. Direct arthrography is the preferred method because it is better for distending or enlarging the joint and imaging small internal structures to allow for better evaluation of diseases or conditions within the joint. The procedure is also used to help diagnose persistent, unexplained joint pain or discomfort. In some cases, local anesthetic medications or steroids may be injected into the joint along with the contrast medium. These medications may temporarily decrease joint-related pain or inflammation and provide physicians additional information about possible sources of joint pain.